I was in my twenties before I ever tasted rhubarb. My family never made anything with it. In fact, I distinctly remember my mother saying that she didn't like it. It was stringy. It's funny how your parent's food prejudices transfer to you. And by funny, I mean how sad and what a waste of twenty some odd years without rhubarb. I have spent the past 10 springs eagerly awaiting rhubarb's arrival at the market. I bought my first rhubarb of this season last week. We were making dinner with the family of one of Louis' students, and I wanted to make a pavlova with a rhubarb and strawberry compote. It was delicious. There is something so luxurious about pavlova. Meringues are partially baked until the outer shell is crisp, but the interior remains marshmallowy. Pavlova are often topped with whipped cream and berries or berry sauce. 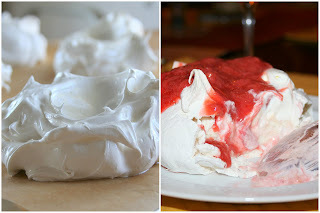 There is a good tutorial on making pavlova here. The tartness of the rhubarb complements the sweet meringue and cream beautifully. There was plenty of compote leftover, so I also used it to make a rhubarb and strawberry shortcake. I made some cornmeal scones, sliced in half, slathered on some whipped cream and rhubarb and strawberry compote. Et voila, rhubarb and strawberry shortcake. Half of the rhubarb and the strawberries are added near the end of cooking so that they remain whole and give the compote a bit of texture. The rhubarb should be soft but not falling apart. Put half of the rhubarb into a medium sized saucepan with the sugar. Slice the vanilla bean open and scrape the seeds into the pan with the rhubarb and sugar, and add the vanilla pod. Add a couple of tablespoons of water to the pan and bring to a boil over medium heat. Cover the pan and cook the rhubarb for 10-15 minutes, stirring occasionally to prevent scorching. The rhubarb should be completely soft and starting to break down. Add the rest of the rhubarb to the pan, cover and cook another 3-5 minutes. Add the strawberries and cook uncovered for 2 more minutes. Transfer the compote to a bowl and cool. Store covered in the refrigerator for 3-5 days. The coconut flavor in this pudding comes from coconut milk. Make sure that you are using the unsweetened stuff often used in Thai cooking. The pudding is delicious served hot or cold. I let mine sit in the refrigerator overnight and folded some whipped cream into it just before serving to give it an airy texture. Combine all coconut milk, sugar ,rice and 3/4 teaspoon salt in heavy large saucepan. If using vanilla bean, scrape in seeds from bean and add bean to saucepan. Bring mixture to a simmer over medium heat, stirring occasionally. Adjust heat so that mixture is barely simmering. Cover partially and cook until the pudding is thickened to the consistency of loose oatmeal, stirring and scraping the bottom and sides of the pan frequently, 30-45 minutes. Remove the vanilla bean, if using, or stir in vanilla extract. makes 10 servings of about 3/4 cup . Hi there! I've recently discovered your blog and now I'm addicted! I love your photography, and we have very similar food tastes. However, you've often ventured into untested food territory for me... I've been scared by souffles and intimidated by rhubarb. And I am sad to say I've never even been near a Pavlova. Which is why I'm so glad I found your blog. I can't wait to cook up some pudding and compote this weekend!!! Thanks so much! I'm so glad that I've inspired you to get over your fear of rhubarb. I think you'll love it. Let me know how it goes! I love the photography and I love rhubarb. Yummy. I love rhubarb compote - a more savory one is also good on meats. It just about grows wild in MN. I never had rhubarb until I moved to MN. This looks wonderful - and speaks of spring. Thanks for the comments! We need to start thinking about menu planning!! I imagine that a savory compote would be beautiful with duck or pork. Thanks for the great idea! I've never seen rhubarb growing wild. It must be beautiful. I just made this compote this weekend, and served it spooned over a very mild wheat cake (from Molly's blog). It was wonderful!!! Thanks for the recipe!